Country: Thailand | Beer Apprentice - Craft Beer News, Reviews, Interviews and Info. Hello everyone. For today’s craft beer review I’m going to be trying the Singha Thai Beer produced by the Boon Rawd Brewery Company located in Bangkok, Thailand. I can’t say that I’ve ever had a beer from Thailand before, so this could be an interesting experience. I was able to find a bit of info on this product from the website, http://www.boonrawd.co.th/, that I would like to share with you. A premium lager beer brewed from the finest ingredients, “Singha” is a full-bodied 100% barley malt beer that is distinctively rich in taste with strong hop characters. Well. Let’s see what we have here. This alcoholic beverage has an ABV of 5.0% and it comes in an 11.2 oz. bottle. The beer poured a very clear, straw yellow to golden color. It had quite a few bubbles streaming up from the bottom of the glass. The collar was bright white and kind of soapy with some small bubbles sticking closely together. The size and the retention time were only average and the lacing was largely sub-par. As I stuck my nose in to gather a whiff, I was greeted with a very clean grain and grass aroma. I also picked up on hints of unsalted crackers and wafers. There may have been a very mild sweetness mixed in too. It seemed to be balanced ok, however it was rather simple and straight forward. Overall, the bouquet was altogether mild and insignificant. The taste was a tad more forthcoming. It revealed more of the grassy and grainy zing, but I also found a clean, white bread flavor and a delicate lemon sweetness. Again, balanced ok, but still mostly mild, timid and faint even though it was a touch stronger than the nose. The mouthfeel was medium to medium/thin. It was crisp, clean, snappy and thirst quenching. I thought this brew might be somewhat watery on the mouthfeel, but it was actually quite dry. Not much flavor was left behind after the swallow though. It was gone fairly quickly. Meh. Not really much more to say I don’t guess. 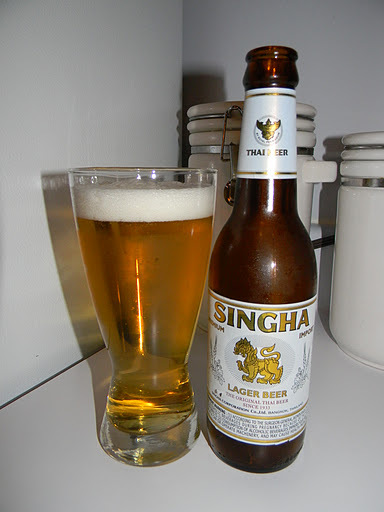 The Singha Thai Beer is just an average to slightly below average beer. Maybe a half step above the “Big 3” macros. It didn’t really present anything that was off-putting, yet I never found anything outstanding either. Everything just seemed a bit feeble. Other than that, it was very easy to drink and would pair well with the warmer days of Spring and Summer that’s for sure. I don’t think I would seek this out if I were you, but if you happen to see it sitting on a shelf somewhere, it might not hurt to pick up a bottle. If nothing else, you could say that you’ve sampled a beer from Thailand. That’s a conversation piece in of itself. As always, thanks for reading and commenting folks. Be sure to look me up on Twitter (@BeerApprentice or @shrews824) or find me on Google+ (Scott Shrewsberry) if you’d like.